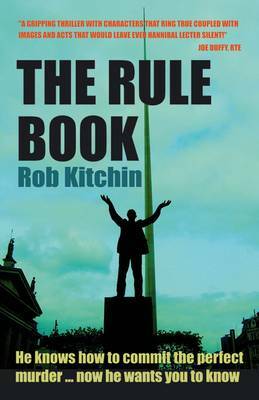 Yesterday I started reading THE RULE BOOK, the debut novel from Irish crime writer Rob Kitchin. I am about 1/3 to 1/2 the way through, and really enjoying it thusfar. This doesn't surprise me, as I had recommendations about the book from several book bloggers whose opinions I value. I understand Kitchin's second police procedural is coming out next month - THE WHITE GALLOWS. The sequel looks equally interesting, so hopefully Kitchin's audience continues to grow. In THE RULE BOOK, it is April in the Wicklow mountains and a young woman is found dead, seemingly sacrificed. Accompanying her body is Chapter One of "The Rule Book" - a self-help guide for serial killers. The case is assigned to the National Bureau of Criminal Investigation and headed by Detective Superintendent Colm McEvoy. Since the recent death of his wife, McEvoy is a shadow of his former self - two stones lighter with a wardrobe of ill-fitting suits, struggling to quite the cigarettes that killed his wife, and still getting used to being a single parent. Less than twenty-four hours later a second murder is committed. Self-claiming the title 'The Raven', the killer starts to taunt the police and the media. When the third body is discovered it is clear that The Raven intends to slaughter one victim each day until "The Rule Book" is published in full. With the pressure from his superiors, the press, and politicians rising, McEvoy goes after a killer that is seemingly several steps ahead. Is the "Rule Book" as definitive as The Raven claims? Kitchin is a director of a National University research institute in Ireland. He is also the author or editor of 17 academic books, and edits an academic journal, two book series and has edited a 12 volume encyclopaedia. He blogs on reading and writing at The View from the Blue House. You can read my 9mm interview with Rob Kitchin here. a review at DJs Krimiblog. Have you read THE RULE BOOK? What did you think? Do you like the sound of Irish police procedurals, or a new take on the serial killer sub-genre? Please share your thoughts.